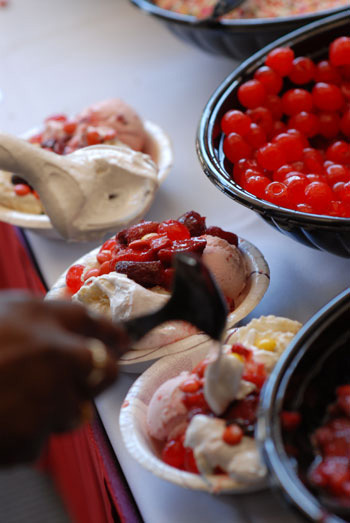 We feature a smorgasbord of Richardson’s own ice cream and frozen yogurt flavors, hot and cold sauces, and over a dozen toppings to offer a custom-made afternoon treat as a drop-off or catered event with staff. This menu is great for offices, summer picnics, or even a sweet alternative to cake on your wedding day. whipped cream, rainbow or chocolate sprinkles, M&Ms, Reese’s Pieces, Heath Bar topping, maraschino cherries, gummy bears, Oreo cookie pieces, and chopped walnuts are our featured toppings, but if you’re craving something that you don’t see here, please ask! Service is highly recommended for replenishing supplies and cleanup. Pricing is based on groups of 50 or more; for smaller groups, additional charges may apply.